Re-engineering your thinking as well as your technology will open your business to extraordinary opportunities. In a time of fierce competition and growing uncertainty for shipbuilding worldwide, with an evolving market demand and shipyards struggling to meet pressure for lower cost of ownership, the industry needs to rapidly change the way it operates. In short, it needs to fully embrace the competitive advantages of digital transformation if it is to survive. Many shipyard leaders now realize that to become more competitive and improve profitability – cutting down time and cost to market – they must transform the way their organizations operate, unlocking new efficiencies by working smarter and faster without sacrificing quality. But how, from a practical standpoint, can that be achieved? Crucially, the industry needs to understand that digital transformation is not about making everything digital. Neither is it sufficient to add a new layer of digitization on top of legacy processes. Instead, it is about transforming the business from top to bottom leveraging the right technologies in order to align with strategic objectives. From the shipyard boardroom table to the shop floor. Coordinated transformation of the whole organizational ecosystem and business processes across the entire lifecycle is the way forward. Discover the business pillars and the key enabling technologies behind the digital transformation of shipyards. It follows that the most successful new captains of the industry will be those who can make that essential distinction between technology as an end and technology as a means: between ‘digitalization’ and ‘digital transformation’. The article ‘We need more than a digital paintjob’ by Marianne Alfsen, quotes Marco Ryan, Chief Digital Officer & Executive Vice President at Wärtsilä, and the author of several books on the digital reality facing business today. Ryan argues that new technologies constitute just one aspect of digital transformation: “Digital transformation is about fundamentally re-engineering the company. Without it we cannot create the necessary new business models, find the right people or develop the right technologies”. To make Ryan’s vision a reality, digital transformation needs to be embraced culturally – as well as operationally – throughout an organization. This will result in a metamorphosis that delivers productivity gains and efficiencies via smarter engineering, production and supply chain management. 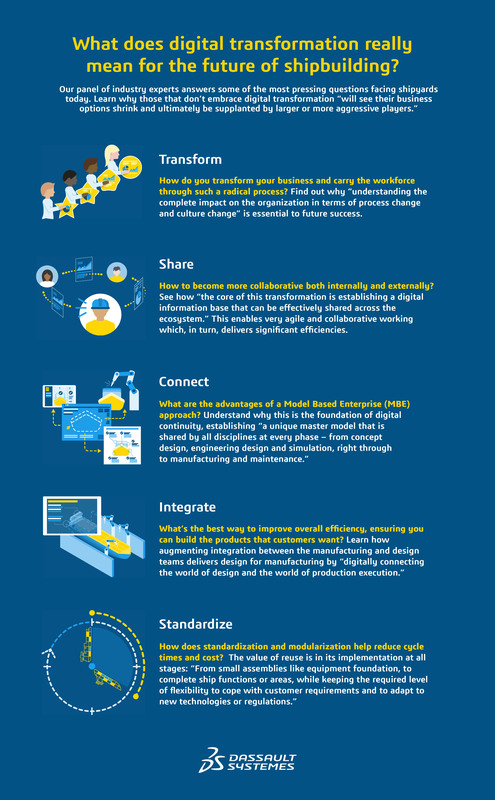 What does digital transformation really mean ? To support true digital transformation, it’s necessary to connect the dots across the Marine & Offshore value creation chain: sustaining digital continuity from initial concept, through engineering design and simulation, via production planning and manufacturing execution, right the way through to maintenance and repair. Therefore, choosing the right technology on the right platform is vital to success. It will empower close collaboration between all disciplines integrating processes and assuring end-to-end continuity by sharing the same source of real-time information. A single source of truth that unlocks efficiencies, increases productivity and secures profitability via data-driven processes and decision-making. ‘Data-driven’ is the key term here – emphasizing the importance of investing in a platform that allows the full and smart exploitation of all the data at your disposal to improve operations. “Data is everywhere. We are beginning to see a transformation in how the ship construction segment approaches data, notably with the integration of tools onto a common collaborative platform, which helps to ensure more end-to-end productivity of design and manufacturing,” said Philippe Donche-Gay, President of the Bureau Veritas Marine & Offshore Division, in an interview with Compass Magazine. Digital transformation is a major initiative across Bureau Veritas. Our Marine & Offshore division is piloting this effort, the most important piece of which is a 3D modeling initiative. This includes adopting cutting-edge solutions to support the customer experience, solutions linked to our own productivity, as well as a scheduling tool to assist the surveyors. The European leader in naval defense systems, Naval Group, shares Donche-Gay’s conviction that an integrated digital platform is the key to attaining data-driven operational excellence. Be inspired by these real-world examples of Marine & Offshore companies that have navigated enormous challenges with the 3DEXPERIENCE platform. Discover how Naval Group, the European leader in naval defense, CSSC Huangpu Wenchong Shipbuilding Company, one of the largest Chinese shipyards, and NAOS Ship and Boat Design, a trusted design partner to a number of shipyards, embarked on the digital transformation journey to improve their competitiveness. This is achieved by using a unique 3D ship master model containing asset information throughout every phase of the lifecycle, from concept to delivery to maintenance. Naval Group’s experience illustrates how having all your stakeholders working in real-time on the same platform with a 3DEXPERIENCE twin connecting the dots between people, disciplines/functions, processes, and IT systems leaves behind the old, siloed way of working and opens up extraordinary new possibilities. Simulation is no longer the realm of ship design and engineering. It equally applies to all stages with the optimization of manufacturing processes and the relationship with the shipyard resources. Shipbuilders that are progressive in optimizing their operations are seeking the means to capture existing knowledge in a form and function that can be updated, enhanced and reused for a generation to come. They are melding not only generations of accrued experience, but also company process and procedure that can be melded across its entire design and production planning structure, giving them a leg-up on competition that opts to ‘start from scratch’ out the outset of each project. Such smart, holistic thinking will be the salvation of Marine & Offshore. It is essential for those shipyards that wish to benefit from genuine digital transformation. It’s a strategy that will help them set a true course for leadership in this most competitive of industries, ultimately delivering the digital shipyards of the future. Learn more about how our Industry Solution Experiences can help you to achieve your professional ambition and business objectives.